The improvisational trio 1982 consists of Nils Økland, Sigbjørn Apeland and Øyvind Skarbø. The trio has already released three critically acclaimed albums. On their previous album the musicians collaborated with pedal steel legend BJ Cole. This time they have invited wind players Fredrik Ljungkvist (Atomic), Erik Johannessen (Jaga Jazzist), Sofya Dudaeva, Hanne Liland Rekdal, Matthias Wallin and Stian Omenås (Stian Omenås Klangkammer) to participate in an unusual collaboration. As the title of the trio’s fourth album, A/B, indicates, it is divided into two parts. The album is built up with the classic LP structure of an A side and a B side, with a long piece, 18:16 minutes, filling the entire A side. This piece clearly stands out as the most distinctive in 1982’s discography up to now. Taking his point of departure in improvisations recorded by the trio, trumpeter and composer Stian Omenås has “expanded on” the idiom and has composed and arranged music for a wind sextet that has been layered on top of the original improvisation. On the B side we once again hear 1982 in the form of a trio, with several new ideas that serve to enlarge the 1982 universe. Sigbjørn plays piano on one track, and Nils Økland sings. “Our goal is to continue to develop things further, and I feel that we’re managing to do just that,” says Skarbø. The musicians of 1982 are improvisers to their very marrow, and everyone who has seen and heard them in concert knows that they love to surprise their audiences. The recordings of 1982 were made at Grieghallen Studio in Bergen just before the studio was closed down in the summer of 2013. The wind sextet was recorded at Rainbow Studio in Oslo with technician Jan Erik Kongshaug. Recently 1982 has also made a recording, not yet finished, with a fourth person. The group will participate in a live project related to animated film, and will compose a commissioned work for NOTAM (the Norwegian Center for Technology in Music and the Arts). The members of the group have also begun thinking about yet another recording project to be completed for the trio’s 10th anniversary in 2017. The pleasure is to be gained in the way the ensemble manage to keep their hazy, languorous interplay alive as squally clarinet and unsettling horns cycle through the harmonic undergrowth to jostle unsettlingly. Recorded last summer in Norway the shorter B-side pieces are just the trio stark in their repose but complement the longer piece with the wind ensemble well, and this stimulating album has a logic to it as well as plenty of ideas. 1982 befester posisjonen som en unik triostemme, og klinger nå også med vellykket orkestral utvidelse. It’s a dramatic hot air balloon flight, and the brass and woodwind sidle past me like wispy, cotton wall condensation, playfully nudging the yaw of my drift in grand chicanes across the skyline. Tiny breaths and clunking buttons sound like the vintage creaks of my wooden basket, or the ropes and leavers knocking against the framework – it’s an idyllic and colour-saturated opening, and perhaps it’s my own fault for being so blissfully oblivious to the streaks of grey thickening across the cloud perimeters. In the absence of any rhythm to cling onto, I float into the dissonance that curdles surreptitiously into being like an unforecast summer storm, as violins turn from glossy ribbons into sharp fizzles of lightning; just as I feel helplessly swallowed up by the atmosphere that tilts from light into dark (and eventually back again), the players on A/B tumble into the black as though unable to stop themselves, puppeteered by a momentum that becomes increasingly vigorous. …Die Bläser bilden einen gedämpften Saum, aus dem sich die Posaune mit sonorem Gesang erhebt und die Flöte mit sich zieht. Bis zum sanften Ausklang dieser Impression, dieses Stimmungsbildes, das, so subtil es auch die naturromantischen Saiten zupft, doch deutlich Morgenluft aus Wiesen aufsteigen­den lässt. Das Trio allein scheint anschließend erst ganz andere, nämlich folkig rockende Saiten aufziehen zu wollen, versinkt aber ebenfalls bald wieder in Nebelschwaden und zart gedämpfte Impressionen. Økland beginnt sogar sanft raunend zu vokalisieren. Bei ‚01:08‘ kommt ganz kurz Unruhe auf, ein Murren des Harmoniums, ein Sich-Kratzen der Geige. ‚05:00‘ lässt, zartbitter geigend, summend und auf sanften Sohlen, das tagträu­merisch verstrichene nebulöse halbe Stündchen ganz elegisch verdämmern. 1982 har meislet ut sin egen hylle i stein i den åpne klassen, og det er alltid spennende å se hva de legger oppå den. Musikken til Omenås framstår meir som ein sjølvstendig komposisjon enn blåsearrangement til ein improviserande trio, men spanande musikk er det blitt, lell. Det er parti der blåseensemblet spelar oppå og rundt Apelands orgelklangar som gjev gåsehud rett og slett. Resten av CD-en (B-sida av vinylen) er sett saman av fem kortare improvisasjonar meir i tråd med 1982 slik me kjenner dei frå dei to første platene, men trioen utvidar klangpaletten ved at Apeland spelar piano og Økland nyttar røysta. Både Økland og Apeland er opptekne av det skulpturelle i musikken, og framleis fascinerer dette enormt, men dei har òg gjeve rom for det leikne som konsertane deira har nøgda av. Å involvera Stian Omenås var eit sjakktrekk. Ei svært vellukka utgjeving. 1982 are augmented by a six-piece brass and wind section performing a pre-composed arrangement accompanying the trio´s improvisation, navigating a landscape which turbulently traverses between shrill dissonance and ruminative reed burbles, bringing forth imaginings of where Talk Talk could have vanished to after Laughing Stock. Side B finds the core trio rifling through a slender notepad of short musical sketches and appendices linked to that magnificent A. It´s an exemplary piece with real emotion blurring the lines between improvisation and composition. 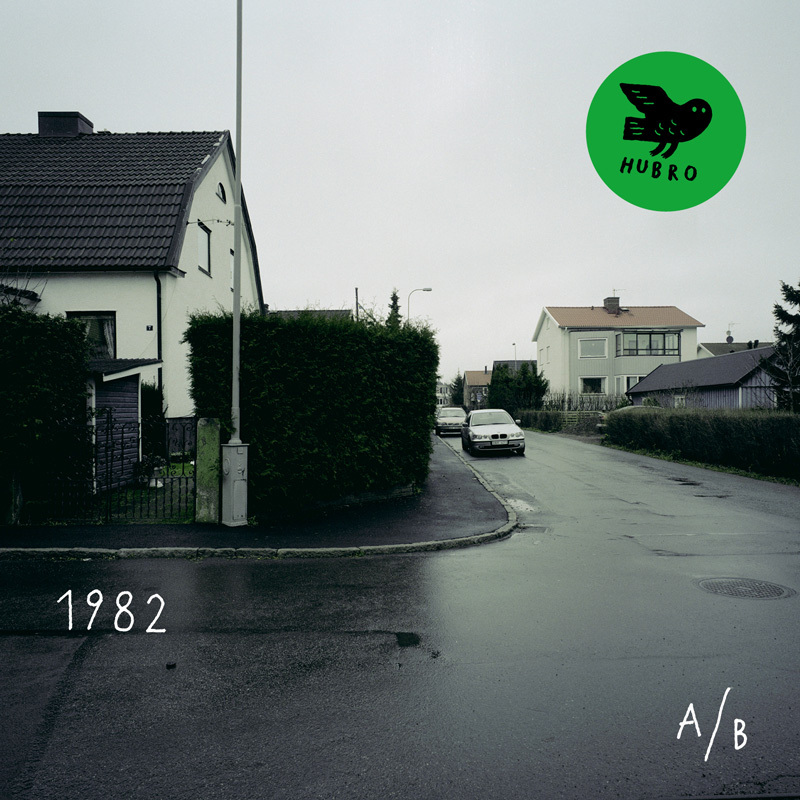 A/B, which is the fourth album from Norwegian improvisational trio 1982, is without doubt, the best album of their career. Flawless describes this Nordic minimalist epic. So does innovative, understated, wistful, melancholy, dramatic, dreamy, eerie, beautiful, broody, moody and haunting. A/B are all these things and more as 1982 seamlessly, mix musical genres. Everything from ambient, avant garde, classical, drone, experimental, free jazz and jazz is combined by 1982. The result is A/B an album of groundbreaking sonic journeys. A/B’s centrepiece is 18:16, the album’s Magnus Opus. It’s a collaboration with a wind sextet. This collaboration was one of the most ambitious pieces of music 1982 have ever recorded. Quite simply, it’s a groundbreaking piece of music that for 1982, will be game-changer. Omenås captured beautifully the emotional, melancholic atmosphere of the original improvisations and succeeded to form an organic interplay between the improvising trio musicians and the latter, expanded arrangement. He restructured the piece as a subdued and nuanced chamber suite, adding to the intuitive, spontaneous piece more colors, dramatic dynamics, and depth. His meticulous arrangement solidifies the Nordic folk and spiritual references of the 1982 sound, but within a broader, contemporary context. The B side features the 1982 trio continually developing its highly personal sonic universe. Apeland plays the piano on one piece, “02:01,” and Økland uses his vocals on “03:12.” These five short pieces were recorded at Grieghallen Studio in Bergen just before the studio was closed down in the summer of 2013. These pieces highlight the playful and unorthodox manner of improvisation of this trio, always keen to challenge and surprise itself. The cinematic pieces may suggest where 1982 goes next, playing live music to animated film. All manage to sketch a vivid, lasting contemplative state-of-mind. Highly original and emotionally captivating. Mektig impro…En forsterket improtrio utforsker og overrasker. Lekenheten står sentralt. Det er både oppsiktsvekkende og hyggelig å høre hvordan den norske musikksenen fortsetter å produsere kvalitet på dette feltet. Med sitt nye album “A/B” har den improviserande trioen 1982 teke eit nytt kvantesprang. Interesting new release by the trio of Nils Økland (Hardanger fiddles, violin), Sigbjørn Apeland (harmonium, piano) and Øyvind Skarbø (drums, percussion). Previous recordings have developed a personable sound of chamber music and Nordic jazz in an improvisational setting. This time around, they add a bevy of wind instruments on the 18+ minute opening track (the “A” side), and despite the crowded room, the music retains the spacious ambiance of past recordings. Dense clouds of dissonance transition into a smattering of fluttering notes and expansive drones, resulting in early-morning music that has just enough going on to accelerate the waking process. The “B” side of the album has the artists scaling back to a trio format, with no drop-off to the album’s evocative effect. It’s the avant-garde touch that the 1982 trio of Økland, Apeland, and Skarbø applies to their minimalist chamber music that draws the ear in. A variety of strings, keys, and percussion establish a quick foundation of serenity, then immediately goes about chiseling peculiar formations into that peacefulness. Ultimately, they never come close to shattering that penultimate serenity, but they do shape it into something that is vaguely disquieting and supremely compelling. Tangentspiller, komponist og etnomusikolog Sigbjørn Apeland er en grenseoverskrivende musiker. I trioen 1982, som også består av Nils Økland på hardingfele, fiolin og stemme og Øyvind Skarbæ på trommer og perkusjon, deler de to sistnevnte Apelands sjangerblindhet. Noe deres forrige utgivelse, vidunderlige “1982 + BJ Cole”, spilt inn sammen med den engelske pedal steel gitaristen BJ Cole, var et bevis på. På “A/B” strekker Apeland og hans kumpaner seg videre, samtidig som de vender seg innover til det mer intime. A/B contains five short pieces in 1982´s hypnotic style: pianissimo dance rythms, violin laments rejoicing in sensuous timbres, or rootling in the harmonium´s bass department. Økland even sings along with the fiddle at one point, like a man awoken from a dream. This is a trio that excels at leaving each other enough space, and whose musical communication is second to none. Ein weiterer Ausflug in kammermusikalische Welten. Das Trio 1982 verfolgt konsequent den Weg der Kooperation mit anderen Musikern. Nach der Zusammenarbeit vor zwei Jahren mit Pedal-Steel-Gitarrist BJ Cole, geht man nun mit Bläsern einen gemeinsamen Weg. Im einzelnen spielen die Ergänzungsmusiker folgende Instrumente: Klarinette, Flöte, Fagott, Posaune, Saxophon. Das Spektrum des Urtrios erfährt also eine beträchtliche Erweiterung. Die sechs unbetitelten Stücke sind relativ kurz gehalten, lediglich das erste ist auf 18 Munten angelegt und beinhaltet ein reich verziertes Klanggemälde, das rhythmuslos an lange, ungeschnittene Kamerafahrten durch eine Märchenlandschaft erinnert. Die kürzeren Stücke sind etwas weniger oppulent, bewegen sich aber auch meist in kammermusikalischen Räumen, wo es teils geheimnisvoll, teils schamanisch-angehaucht zugeht. Ein Robert Wyatt jedenfalls würde seine Freude daran haben. Die ganze Vorstellung dauert gut eine halbe Stunde und verleitet zum kontemplativen Innehalten. Som tidligere er utgangspunktet improvisasjon, men sekstettpålegget som åpner platen er skrevet for å passe inn oppå trioens opprinnelig fremimproviserte stykke. Stian Omenås har arrangert og dirigert, etter en idé som Skarbø fikk sammen med sønnene til Apeland og Økland. Resultatet er en åpenbaring. Selv om mye av appellen i denne musikken ligger i trioens nøkterne, luftige lydbilde, og det fine mangfoldet de skaper til tross for begrensningene som ligger i besetningen, åpner det seg en tiltalende ny verden med blåseinstrumentenes inntog. Det låter både strengere og mer åpent på samme tid. På ”A/B” har de bjudit in temporär blåsarensemble och denna gång blir resultatet med gästmusiker mycket bättre…Det är musik som fortfarande är mycket konkret till sin natur samtidigt som den strävar efter upplösning. Bilden som kommer för mig är den av dimma som stiger ur den brunsträva marken, dimma som blir tätare och tätare tills den börjar tunnas ut igen i stråk som bara vagt påminner om den ursprungliga beskaffenheten. Det är inte helt oväntat blåsinstrumenten, som sträcker sig från flöjt till fagott, som ger musiken sin intagande dubbelnatur av upplöst och taktil… Den avslutande ”5.00” är skivans mest sordinerade stycke men trots det, eller kanske just därför, närmast elegiskt. ”A/B” motsätter sig hög volym och kommer bäst till sin rätt om man respekterar dess introspektiva art. A/B, the fourth album from the trio 1982 opens with a stunning, untitled 18-mnute mood piece (listen to an extract below) where Nils Økland’s Hardanger fiddle and violin gel with waves of Sigbjørn Apeland’s harmonium and organ while effortlessly accommodating the bassoon, clarinet, flute, horn and trombone of a specially assembled quintet. The pulsing waves of each instrument and their interplay make A/B a beautiful experience. Stillfarende, klangrikt og fantasifullt. Som trio er gruppen kjent for sin avdempede og fredfylte grublerier, men i det større gruppeformatet blir det mer handling og ere former for innspill som garanterer for større variasjon og dramatikk. I de kortere sporene som utgjør side B er vi tilbake i trioformatet. Også her løper leken og fantasien fritt. Nils Øklands sakrale felespill, Sigbjørn Apelands melankolske orgelunderlag, og det dunkle, malende trommespillet til Øyvind Skarbø, pensler ut seks korte, velformede lydskisser som viser lytteren veien, uten at stien føles ferdigtråkket. Musikernes valg kjennes langt fra tilfeldige, men vi får likevel en følelse av at noe forblir usagt, og vi må fylle inn “det som mangler”. Mais um disco de cinco estrelas para os 1982: será problema meu? Este novo lançamento, intitulado “A/B” (lado A e lado B, como nos LPs, com o lado A feito de uma peça longa e o B de temas mais curtos), apresenta mais uma ideia interessante, que é a de ouvir o resultado de improvisações anteriores (particularmente das sessões do disco inaugural do trio, “Pintura”) e a partir desses materiais construir arranjos para um grupo de sopros… A música continua lenta, ultra-lírica, cheia de espaço e com formas musicais interessantes que nunca parecem ter sido feitas apenas por três músicos. Totalmente improvisada, soa perfeita, como se tivesse sido laboriosamente planeada em pauta. Os 1982 são, sem dúvida, um dos meus grupos favoritos da actualidade e ainda conseguem soar melhor ao vivo do que em disco. Precioso. Wenn ein Trio namens 1982 eine Platte mit A/B betitelt, dann ist das nicht nur eine Herausforderung in Sachen Suchanfragenoptimierung, es signalisiert auch, dass hier etwas Ungewöhnliches wartet. Tatsächlich ist die neue CD selbst in der merkwürdigen Welt von 1982 eine Besonderheit. Für die erste Hälfte der Platte, sozusagen die A-Seite, hat die Ø-lastige norwegische Gruppe aus Sigbjørn Apeland, Nils Økland und Øyvind Skarbø den Trompeter Stian Omanås gebeten, zu einer 18-minütigen Trio-Improvisation nachträglich ein Bläsersextett zu komponieren – ein geglücktes Experiment. Die übrigen fünf Stücke bestreiten die drei Musiker an Harmonium, Hardangergeige und Percussion allein und bestätigen, wie schlüssig und eingespielt ihre Interaktion inzwischen ist. A/B, das ist die vierte Veröffentlichung des norwegischen Trios 1982, das 2013 etwa beim Ulrichsberger Kaleidophon zu Gast war. Purismus und Schlichtheit scheinen den Dreien ein Anliegen zu sein, was auch schon der Bandname, das Cover oder die Tracktitel zeigen. Das Gehörte ist dann recht schwelgerisch: Weiten Melodiebögen wird viel Platz gegeben, jedoch ohne auslandende Expression. Die Musiker_innen bringen es jeweils auf den Punkt, sei es im Rahmen des ersten Stücks, einer Komposition für Bläsersextett von Stian Omenås, basierend auf einer Aufnahme des Trios, die zu Beginn noch leise im Hintergrund zu hören ist. Musik zum Dahinträumen, zwischen dronigen Parts voll Schwebungen und allem, was dazugehört, und verspielten Melodielinien. Die zweite Hälfte des Albums umfasst fünf kurze Improvisationen, gespielt vom Trio selbst, mit gewissem Ethno-Touch. Økland spielt auf einer Haddanger-Fidel, Skarbø am Schlagzeug sehr zurückhaltend und dezent. Apeland wechselt zwischen Klavier und Ziehharmonika und eröffnet mit einem hämmerndem Klavierbeat etwa den zweiten Teil. Die Kombination von Hardanger Fidel, Ziehharmonika/Klavier, Stimme und Schlagzeug klingt nach überzeugendem Kitsch. aussi : face A/face B, pour marquer leur attachement au format LP. On n’en sort pas. Un CD concept donc, comme le suggère l’image qui orne la couverture : un cliché d’une morne banlieue pavillonnaire. Rien à voir avec la bande-son, une thématique climatique qui invite à s’échapper du réel, qui trace un horizon entre l’instantané et le contemporain. Difficile de dire ce qui tient de l´improvisation, ce qui vient de l’écrit, dans ces lignes claires-obscures qui croisent trois univers : l’avant-garde folk avec le violoniste Nils Okland, le baroque abstrait de l’organiste Sigborn Apeland et le jazz le plus open minded du batteur Oyvind Skarbo. L’improvisation en jazz doit avoir encore un sens (recherche de pureté, mysticisme). C’est sans doute ce qu’essaie de nous dire ce trio norvégien en utilisant tout simplement ce qui fait l’essence du jazz, la liberté. Cette musique est si langoureuse et addictive. Bienvenue à ce nouveau label venue du froid dont les pochettes sont déjà des promesses. Evans de Barbara Song et Gérard Grisey. Fascinant.